This luncheon seeks to address challenges that women doing scholarly work face, fostering kindness, connection, and positive steps toward health. 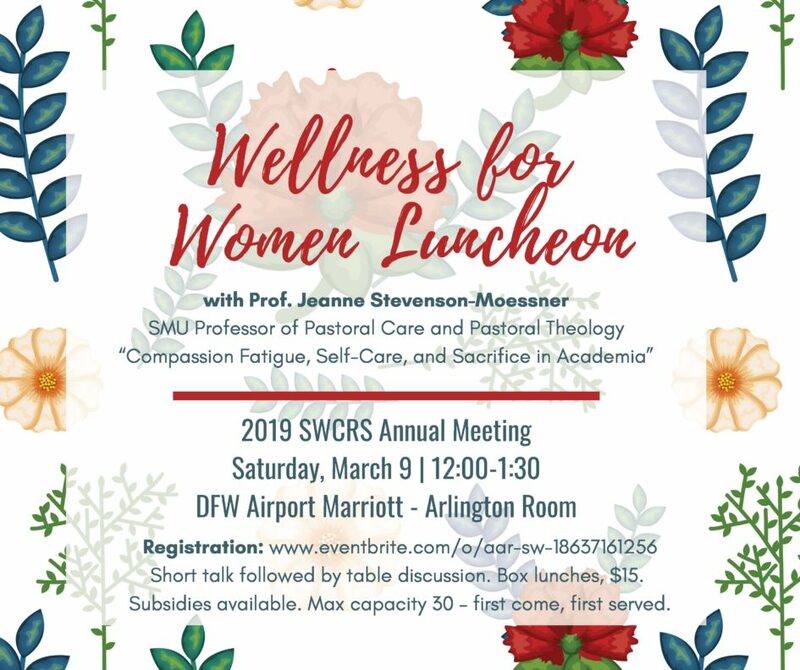 It will feature a short talk, “Compassion Fatigue, Self-Care and Sacrifice in Academia” by Prof. Jeanne Stevenson-Moessner, SMU Professor of Pastoral Care and Pastoral Theology followed by structured table discussion. A willingness to share issues and wisdom from your personal experience will enhance the effectiveness of discussion. All identifying as women are welcome. Please expect a follow-up email from Program Coordinator Jennifer Hancock for the purposes of gathering more information about you. This will help us to create a program best tailored to address concerns. Box lunches will include Turkey/Ham sandwich, Chips, Cookie, Iced Tea. Gluten-free or vegetarian available upon request. Email Jennifer with dietary requests and all other questions at jenhancock73@gmail.com. Max capacity 30. First come, first served. Please request dietary needs at least 72 hours before the event. Thank you!